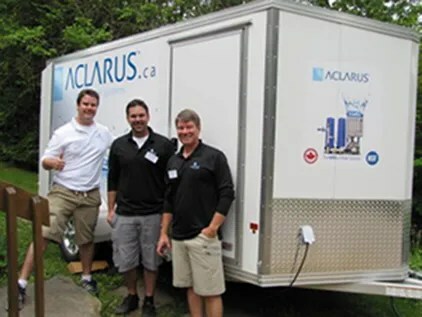 The Greater Peterborough Innovation Cluster was well represented at the recent North Kawartha launch of innovative Peterborough-based ozone water system company and Innovation Cluster client, Aclarus Water Systems. Aclarus celebrated the occasion by hosting a full day demonstration for the local community – which turned out in force to enjoy purified water AND local ice-cream – at Eel’s Lake Marina in Apsley on Saturday, June 29th. The Aclarus water system represents a new era in water treatment: being the most advanced ozone water system available on the market and the only NSF-61 approved ozone system. The Canadian built units use a proprietary ozone producing and mixing process to purify water – in this case, lake or well water – for safe drinking. These low-cost, low energy systems, with unlimited adaptability to any flow rate and water application, are able to produce 1000 litres for less than .05 cents. The units are low maintenance, low power, and run for years. They provide healthy water, rich in oxygen and minerals for the safest drinking, cooking and cleaning. Ozone is the fastest, strongest, and most natural disinfectant. It is 3,000 times faster – and 300 times stronger – than chlorine; produces no byproducts; preserves healthy water minerals; and super saturates the water with oxygen. Aclarus has received support from Community Futures Development Corporation and the Centre for Alternative Wastewater Treatment at Fleming College. Aclarus was featured on “Ontario Morning” on CBC Radio on May 17th. Listen in to the podcast here (the Aclarus slot starts at minute 18! ): http://podcast.cbc.ca/mp3/podcasts/ontariomorning_20130517_56800.mp3. We also partner with academia and industry and provide support to startup technology companies and entrepreneurs to help take innovative ideas and processes to market and to foster an environment fueled by innovation. Core funding for the Cluster’s activities is provided by the Ontario Centres of Excellence, Trent University, Fleming College and the Peterborough Region Angel Network. For more information, contact us direct at: (705) 748-1011 x 7006. 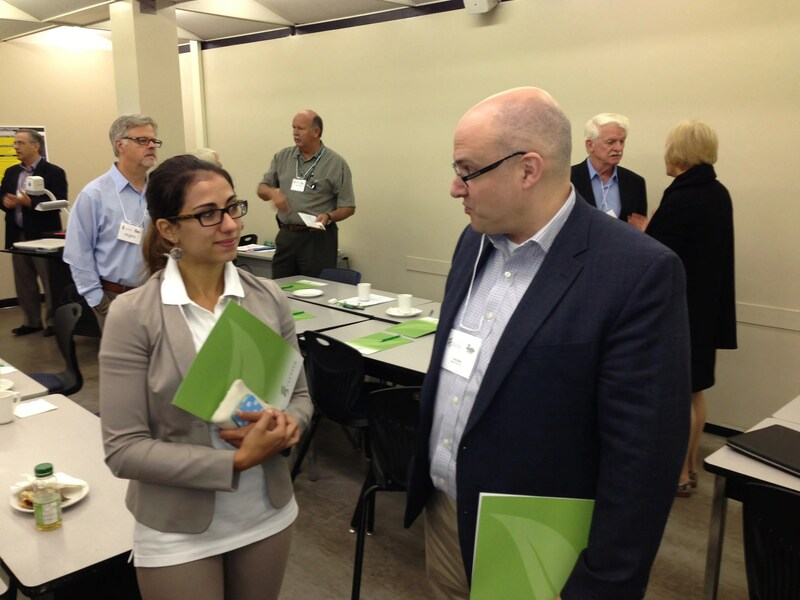 The Greater Peterborough Innovation Cluster (GPIC) hosted the summer edition of our Quarterly Breakfast Series on Friday, June 21, at Fleming College. GPIC’s Quarterly Breakfast Series is proudly sponsored by Bereskin & Parr LLP, one of Canada’s leading intellectual property law firms, with the support of the Stewart Group and community partners Community Futures Development Board and Workforce Development Board. This event highlighted the ever-popular topic of investment opportunities for startups and growth companies, and focused specifically on what investors are looking for; their expectations; and types of investment opportunities. John Fielding, Regional Director of Business Development, Eastern and Northern Ontario (Ontario Centres of Excellence) – John discussed money available through OCE to prepare companies for angel investment, and how they can match angel investment once made to “de-risk” the investment opportunity. Yves Lafortune, Managing Director, Peterborough Region Angel Network – Yves spoke about what angels are looking for in investment opportunities and what kinds of due diligence, questions, and expectations a company can expect when dealing with angels. Paulette Prentice, Economic Development Officer, Federal Economic Development Agency of Southern Ontario – Paulette presented the investment type funds they have for companies in reference to angel investment already in place. The event was a packed house, with 40 attendees from industry, government and academia in attendance. Deliver public and private funding and investment. Supported by our core partners – the Ontario Centres of Excellence, Trent University, Fleming College and thePeterborough Region Angel Network, the Innovation Cluster works to promote industry-academic and industry-industry collaboration as well as to provide support to start-up technology companies and entrepreneurs to help them take innovative ideas and processes to market.